Today we got a bit more news on the Legends 3 Prototype Version! The 3DS store should be pretty close to opening, and anticipation for our first hands-on from the project is really building up! And if that isn’t enough DASH for ya, today we’ll be looking at another DASH character, the devilishly narcissistic criminal virtuoso Glyde. From page 18 of the Tron ni Kobun Secret Encyclopedia (the B-side section of the Tron ni Kobun Treasure-Trove Guide), we’ll get a handle on his personality and look at some of his early designs! The commander in charge of the family’s dirty work may be a pompous, disagreeable man, but he’s also an incredibly gifted pilot! Number 2 in the Loath Family hierarchy, he heads up debt collection services. Despite the impression his effeminate manner gives off, he is actually a super-first-class mecha pilot of exceptional ability who always comes prepared. He and Loath are both wanted for questioning by the police. He regularly pilots his transforming flying ship Rafale for use in his strong-arm loan sharking activities. At a glance, he seems a charming and strikingly handsome fellow. However, his expressions and mannerisms are thick with haughty arrogance through and through. His effeminate way of speaking accentuates his foppish visage. This expression’s a one-shot, reserved for scenes when he’s delivering his signature lines. This is the smug face he makes when he’s bragging about something. Of course, he can usually back up his boasts. When he really wants to get under his opponent’s skin, he pulls out this full of himself expression. This is actually his “kyaaah” expression for when things go horribly wrong. He was VAVA at first!? It seems that in the early concept, he was called “VAVA”. This early design differs in several ways, like the shoulders and the wavy locks of hair. In The Misadventures of Tron Bonne, Glyde does fulfill a similar role to VAVA’s in X1, defeating the hero characters early in the game, only to be defeated himself later on. I’d say VAVA is a more fitting sounding name for this character than the X series one, but I’m also pretty attached to his final name which fits his bird-themed group nicely. I don’t believe they’ve confirmed his return in Legends 3 yet, but I’m sure you can expect him and his birdbot crew to poke their beaks into Tron and MegaMan’s business once again! 12 Comments to "Glyde’s Favorite Subject: Glyde!" 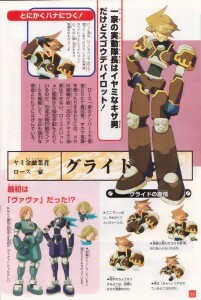 Wow, Glyde was originally going to be named Vava? 😮 You learn something new every day. Glyde.EXE and his operator are both based on Legends characters, yes. Yae or whatever her name is is based on a villager from Legends 2, I believe. Indeed, Yaito. You know your stuff, sir! Also, YOU ARE NOW IMAGINING VILE WITH GLYDE’S HEAD UNDER HIS HELMET. I am now. Glowing red eye and all! We probably can’t see the other eye because his hair’s in the way. If you don’t mind, the concept art is going up on the Database. And yes, let’s see Glyde’s return in MML3! Keep up the good work! You know you’re welcome to whatever you like! Def. hope he shows up again. Not only is his design cool, but he’s got probably my favorite music theme from the Legends series. So, Glyde was always my favorite DASH character and I now know why. I also do admit that I always thought Vile would have a face of beauty. Thank you very much for the article, #20. I had once heard two rumours about Glyde: one about him originally being called VAVA and the other where Mr. Loath had found him the same way Barrell had found MegaMan. I’m glad to find out which one was true.